Energy storage is the single biggest challenge and opportunity for widespread adoption of renewable energy. U3O8 Corp. would produce a basket of “battery commodities” for lithium-ion and vanadium redox flow batteries. Goldman Sachs has stated that “lithium is the new gasoline”, but one could argue that a truer statement is that electricity is the next gasoline, and our challenge is to find efficient and cost-effective ways of storing electricity so that it’s available on demand. Battery prices have been declining steadily, but need to fall further before electricity storage can become competitive and start to displace fossil fuels. As a company with “battery commodities” we have an opportunity to contribute to the deeper penetration of batteries into the energy market. Lithium-ion batteries (LIB) have been so widely adopted because they store a relatively large amount of power for their size and weight (they have a high energy density); they have a high power output, but for a short duration. LIBs are complimented by longer-duration, lower power output batteries like the vanadium redox flow battery (VRFB) that are capable of storing energy on a large scale. LIBs and VRFBs can be visualized as the fast and strong versus the slow and steady. Many other types of battery are under investigation – this is a field that is evolving at a very quick pace. Power delivered from a LIB results from the flow of lithium ions from the negative anode to the positive cathode. Recharging reverses this flow and “restocks” the anode with lithium ions that have migrated back from the cathode. Graphite is the anode in most LIBs, while various designs use different compounds for the cathode. Early LIBs used cobalt in the cathode, but this resulted in the batteries overheating and being relatively unstable. More recent designs include phosphate compounds such as iron phosphate or vanadium phosphate with a mixture of nickel, cobalt, manganese and/or aluminium. 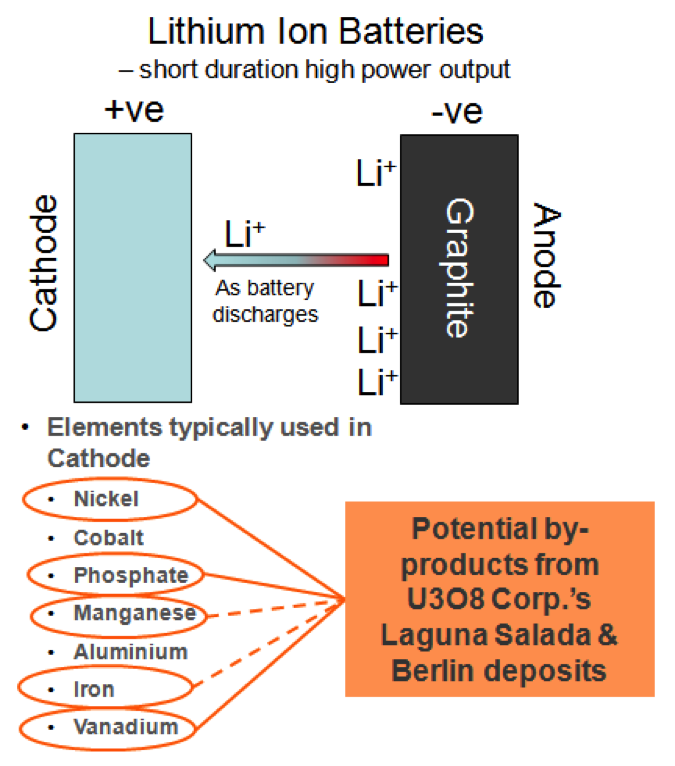 U3O8 Corp.’s Berlin deposit in Colombia would produce many of the cathode commodities including phosphate, nickel and vanadium, while manganese and iron that are introduced in the extraction process could be recovered to augment the package of battery commodities available from Berlin. Vanadium would be produced from both the Laguna Salada and Berlin deposits. 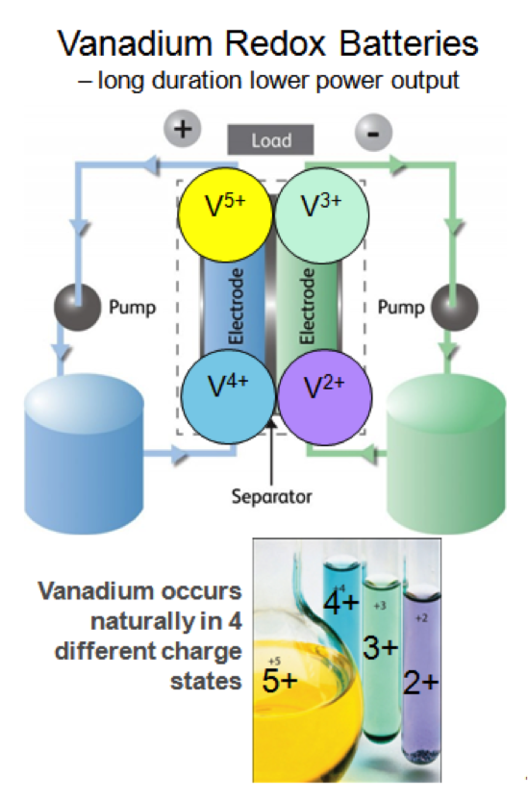 VRFBs make use of the characteristic that vanadium occurs in four charge states – and the batteries work by having V2+ and V3+ constituting the negative anode and V4+ and V5+ together on the positive cathode side of the battery. When liquids from the two sides of the battery come in contact with a metal plate, electrical current is generated. The industrial storage potential of VRFBs is based on the fact that their capacity depends basically on the size of the plastic tanks that store the two vanadium solutions: bigger tanks mean greater storage capacity. VRFBs can be charged and discharged very quickly – almost instantaneously. Since there is no chemical reaction between elements on either side of the battery, VRFBs do not degrade and lose capacity over time as LIBs do. LIBs are good for power required over short time-frames of a few hours, whereas VRFBs are more suited to longer-duration power delivery up to 12 hours and more.